Yes, we are all very aware that everybody makes mistakes.... some more than others. And by some, I mean me. I am a teenager OK, mistakes are made, we need to make them in order to learn. Sometimes we make mistakes that seem alright at the time, but as time goes on, we then begin to realise that we got things a little wrong. I have made some pretty big mistakes in the past ( very few) 16 years of my life. Some, no matter how ' wild and reckless' we teens are I will not, under any circumstance be repeating. (just kidding, I probably will) Arguably, as I have become more mature, I now see the error of my ways and I felt like they would be interesting to share. I say this as a warning before you continue to read this. Please, do not. I repeat. Do not, mirror my mistakes. 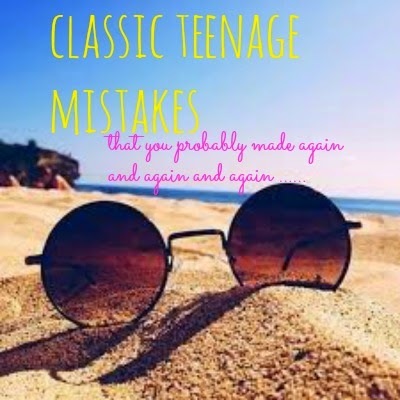 But I would love to here about your own teenage experiences, even if you are no longer a teenager, I would LOVE to hear what you have to say in the comments below! This one is probably something only I did. For some reason I hardly taken any pictures during my teen years so far. I am now realising that I have nothing to remember this time of my life. Take more pictures people! No matter how embarrassing your new hair cut is or because you had a sudden pimple invasion. Ladies (and my fellow gents) please. I can picture the embroided flares now. I thought it looked great at the time but hindsight is a beautiful thing. I was not as divine as I thought I was. As teenagers we are always feeling as if we cannot take a risk in case someone laughs at us or has something negative to say about what we are doing. Or even that we can't try something new I case we embarrass ourselves. But if we stay in that position forever, how are we supposed to grow at all? Friends are amazing people. We need people around us to support and encourage one another. I feel like for many years, I have not made much effort to try and do so. I have always been one of those 'stay in our comfort zone' kind of people. But you never know who you might meet! There are bullies everywhere, waiting for their next victim. please do not allow people to step all over you, you are much, much better than that. Teenagers have spots alright, no big deal. It becomes a big deal when you try to cover them up with countless products ... it just looks worse. Its better to just embrace it! sometimes teenagers become wrapped up in their own little world and try to ignore the directions of people who only want the best for them. There is no point trying to avoid this kind of people because they are not always going to be here to guide us the way they try to do now. I have spent too much of my time, doing somethings that were just a complete waste of my time.As the saying goes, time waits for no one, so we might as well spend it doing something worthwhile! I really enjoyed writing this post , i'm not really sure why! I would love to hear what you all have to say in the comments below, I love reading them. Thanks so much for all of your who gifted me with your kind words on my last post, I really appreciate all the wonderful things that you said! That's it for today, have a fun filled weekend! I knew you were the sassy type Neal, I just knew it! But I try to keep it back (sarcasm, not really sassing people anymore) while blogging I struggled at the start now I handle it better.Does that surprise you? I knew you were a little sarcastic but I never thought that you would be the sort to hold it all back! I struggle so much with getting myself out there enough to make new friends. I also have a hard time with all the awkward and embarrassing things I say and do! I also wast way to much time! I don’t struggle with covering up those spots thankfully! I don’t where any foundation...one less thing to worry about in the morning! I think this stage of life is a hard one for just about every teenager. We are just trying to grow up but keep finding out we don’t know how. I've pretty much made all these mistakes except using product to cover any blemishes. My mum would never let me and I'm thankful. And I take quite a lot of photos. So no worries for that. Oh god though. My fashion just last year was horrendous, and the sass I give sometimes... Haha. I think talking to more people is something I haven't done enough of in the last three years, but I've started recently, and it's working really well. So that's some great advice! I feel like I can relate to all of these! The only category I don't fit into is taking no pictures, I probably take an average of 50 a day haha! haha ! So glad you can relate. Me and pictures do not have the best relationship! We teens just seem to all make the same mistakes, haha! I am just happy I am not alone on this one. thats a great post, though I am not a teen , but can relate. I am glad you can relate! I've done all of these mistakes! ha ha! so many people as saying that!